is that it never stops moving for too long. 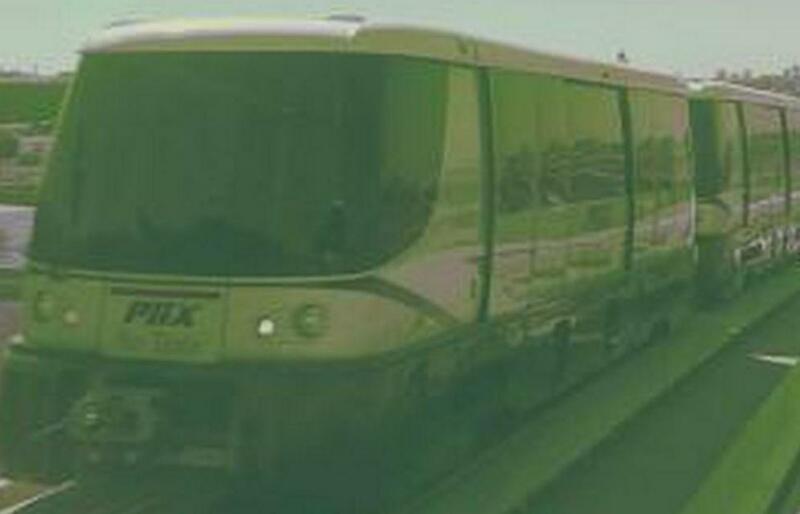 Skytrain to Nowhere is book of poems which all center around the PHX Sky Train in Phoenix, Arizona’s International Airport accompanied by photographs. The poems range from meditations on the train’s structure and design, to observations of its passengers, to odes to the architecture around it, and to observations of what can be seen through the windows. While reading this book, I often found the song “Johnny on the Monorail” by The Buggles playing in my head. The poems here are very similar to the themes of The Buggles in general, but Adamson is far less pessimistic about technology’s impacts on people’s lives. He finds a lot of beauty in the train and it’s surroundings with any cynicism being directed to his fellow passengers. This is especially true in “Skytrain Stowaway” wherein an obnoxious young man bursts into the train and proceeds to make a lot of noise. Adamson finds his hope in man’s ability to achieve greatness that he sees in the train dampened by such behavior. Of course, not all of his interactions with his fellow passengers are negative. In “48 Seconds,” he notices someone else sitting across from him, jotting in a notebook as he is. He feels a connection with him even though they don’t exchange any words. Adamson’s humor in many of the poems is excellent. One example of this is the poem “Bubble Girl” where he finds himself attracted to a woman who boards the train and is disappointed when he notices she’s wearing a wedding ring. He realizes it’s a waste of time to dwell on this let-down, but he can’t help himself. It leads to some of the funniest lines in the book. Many of the poems are quiet beautiful and create some vivid imagery. In some of these, one can feel themselves in the train, riding alongside Adamson as he shares his marvel at this modern means of transportation. “A Postcard to the Sun” is one of the most explicit odes to technological progression. It describes a section of the track where the goes up an incline, making him feel as if the train will actually take off into the sky and towards the sun. One of my favorite poems in the book is “Nautical Dreamer” wherein Adamson imagines the train going underwater and into the city of Atlantis. He imagines the potential of a piece of technology, in this case the sky train, in a fantastic manner like a science fiction author. He also envisions seeing Ecco the Dolphin outside the windows. The accompanying photographs are well-done as well. They have no people, keeping the main focus on the train and on the surroundings in the Phoenix International Airport. There are no unusual angles or any attempts to make the train seem more fantastic than it is. They’re straightforward documentations of the technology which is in our lives right now. Brandon Adamson's poetic tribute to the PHX Sky Train is fascinating, beautiful, funny, and a thought-provoking look at the technology in contemporary life. Because of the numerous problems of today's world, it can be easy to forget that we really are living in the future. Adamson reminds us with this book. Highly recommended.